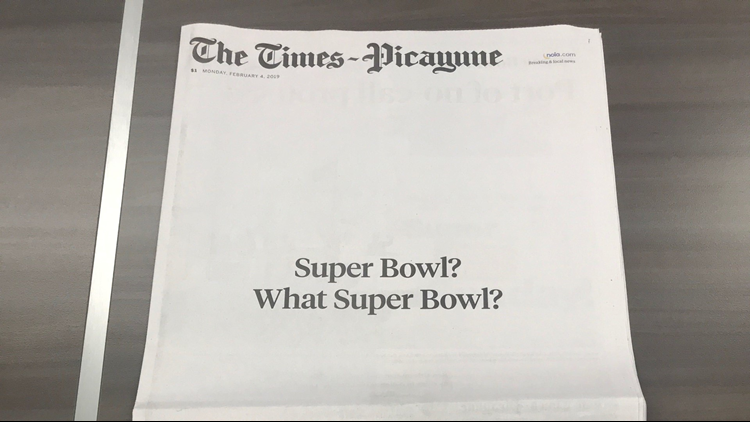 NEW ORLEANS — The New England Patriots won Super Bowl LIII on Sunday, but a New Orleans newspaper won Monday for its coverage – or lack thereof – of the big game. The front page clearly references the missed pass interference call of Los Angeles Rams cornerback Nickel Robey-Coleman’s hit on New Orleans Saints receiver Tommylee Lewis. The play happened with less than two minutes left in the NFC championship game and likely cost the Saints a chance to play in Super Bowl LIII. Thousands of people in New Orleans spent Sunday partying and having a parade in protest of the non-call in the NFC title game. The publication reported overnight Nielsen ratings showed Super Bowl LIII earned a 26.2 rating in New Orleans, which is lowest of any market and the lowest in the lowest ever for the city. Each ratings point represents 6,331 New Orleans households, which is about 1 percent of the local viewing market, according to the Times-Picayune.